A racer asked me recently “how do I get a sponsor, I need money to do this stuff?” That’s a fair enough question, one that haunts almost every racer who starts-up a race engine. Let’s face it, a racer is either racing out of their back pocket or someone else’s, there is no in between. 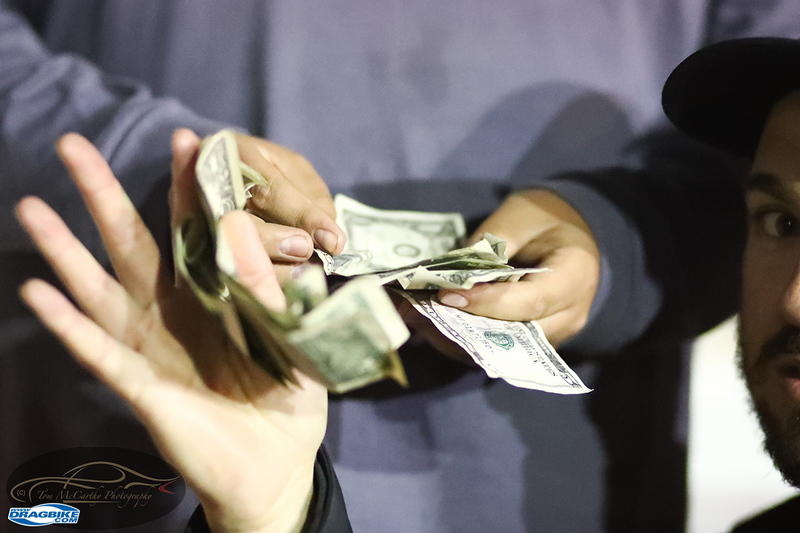 It’s up to each individual racer to decide whose money they are willing to spend. Racers racing out of their own back pocket can only go so far. The teams with a budget, that can test frequently, perform R&D to advance their racing program; this is necessary to become competitive in the professional racing classes. The smaller teams are hard-pressed to compete against this. So seeking sponsorship becomes more important as racers climb the performance ladder. But how to get sponsored – that’s the $64 question. Okay, now add zeros to the aforementioned numbers. Ask not what your sponsor can do for you, ask what you can do for your sponsor. Sticker placement is very important, look at drag bike photos, notice where they are most often photographed from. Ask not what your sponsor can do for you, ask what you can do for your sponsor. Seriously, what can you do to help your sponsor sell their product or service? Also very importantly, what are you willing to do for your sponsor? How many shows a year will you show your machine at? How many appearances a year, when and where, will you show up with your race rig to support your sponsor? PUT IT IN WRITING! Consider your sponsor’s potential ROI, that’s Return On Investment. If a sponsor is ready to fork over $1,000, can you help them sell 2-3-4-thousand dollars in product or services? If not, can you give them the very valued name recognition they need to stay in the public eye and be relevant? What is the dollar value to that? Learn how to negotiate this. Can you meet your sponsor’s expectations? Every sponsor has every right to expect something in return for the money they are willing to spend on a racer’s racing program. Racer’s need to be ready to accept the fact that they must stand and deliver as agreed upon. Better yet, deliver more than you promise and you’re on the right track to getting and keeping a sponsor who WANTS to work with you! Is your racing program ready for this? Ask yourself this question and be honest about it before you jump in. When a racer steps up and goes sponsor hunting, then finds one, that racer had better be ready and financially able to go to all the races they say they will attend, make sponsor appearances as agreed upon, and do so in a professional manner at all times. THINK about what you are getting yourself into, the time and monetary commitment. This will affect your family life, your social and professional life. Now for some cold water: get a lawyer. Find a good business lawyer consult with him/her, frequently, keep them available to give you good counsel. You’ll be glad you did. Be professional at all times. Your appearance, your mannerisms, the way you handle yourself in public matters. This includes social media behavior. No sponsor wants to give money to people who they themselves would not associate with. A sponsored racer is a representative of the sponsor and or the product/service they promote. It’s far more likely a sponsor will find you before you will find a sponsor! If you are sharp, your team, the bike, the leathers, that’s a strong representation. Add impressive performance numbers to this and it’s a winning combination that can help you get noticed. But getting noticed is only part A. The next step is the important one. Part B: are you a good fit? Your race program, the number of events you need to amass championship points in, your annual road trips; how do they mesh with what the sponsor needs and expects from you? Ask yourself and think of your teammates, can you deliver and in fact exceed the expectations of the sponsor? If not, you may be better off to pass on some sponsor proposals. I have seen racers become absolutely miserable in trying to go from race to race and while doing this, try to budget time to do sponsor appearances, when they knew they should be testing. Unhappy racers and team members do not perform at their best. Your teammates a reflection of you and your racing program, consider their place in your racing efforts, are they ready to step up? It’s all well and good that you are ready to go do 10 races a year, coast to coast, but are they? Do they fully understand the commitment here? Sponsorship is a relationship between a racing program and a vendor with a need for their services. Here’s the bottom line: it’s your association with people and the interactions that will ultimately land you a sponsor – or not. The single most important element in landing a sponsor that is a good fit you and your race program is NETWORKING! Interpersonal relationships, your relationships with the people you connect with every day, that’s your biggest asset in finding a sponsor. If you want to find a sponsor, you need to make friendship a fine art. Learn to shake hands with a firm grip and look people straight in the eye when you speak to them. Always say what you mean and mean what you say. When you do, one day the sponsor will approach you. 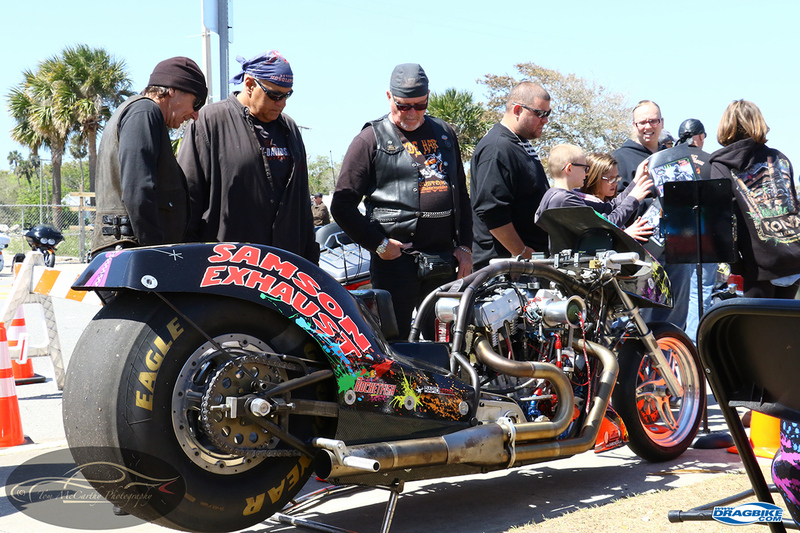 Prior to the 2018 NHRA Gators, Dennis Fisher had his TF motorcycle on display at Daytona Bike Week. 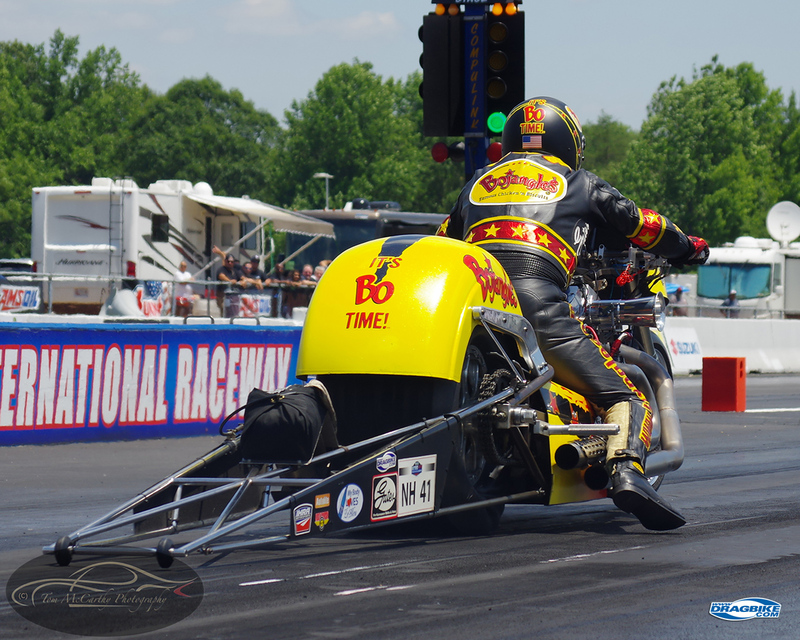 He not only gave his new sponsor major exposure but had the value-added bonus of exposing the general public to a radical Top Fuel motorcycle their by interacting with a new fan base. Can you beat the bushes and find one? Well yes, that does happen. But be prepared for a lot of rejection letters and last minute disappointments before you strike gold. Consider this normal in sponsorship hunting, that it’s going to be rough and know this my friends, things could be worse; you could end up with the sponsorship from hell. Picture this, you land a sponsor, then you get another one and their associate comes on board, now you’re cooking with gas and burning nitromethane! You buy a big rig, hire staff and plot a full season of racing, you did it: you have a six or seven figure race budget and now you’re spending like a sailor on shore-leave. Then it happens, the phone call no one wants to hear: it’s over. 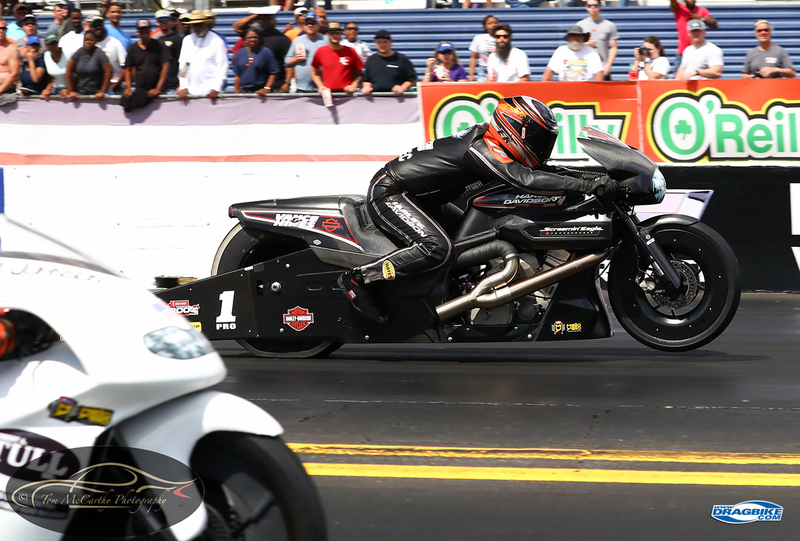 Harley Davidson plus Vance & Hines Racing are a marketing match made in heaven. They not only win but look like winners at all times. A very sharp team presentation. Your whole life has been leading up to this moment and you have finally made the big time and mid-season your primary sponsor pulls out. Let’s for the sake of discussion say they are and overseas asset and let me warn you, the business laws of the USA do NOT apply in the country of XYZ. You can complain to the US Department of State all you want, but really, save your breath and litigation fees, if it’s outside the USA, go buy a pot, at least you’ll have something to piss in. Here’s why this is the sponsorship from hell, you have other sponsors who are counting on you right? You promised them ABC and you are obligated to deliver; correct? What about your employees and their families, they are counting on you too; how do you cover this? 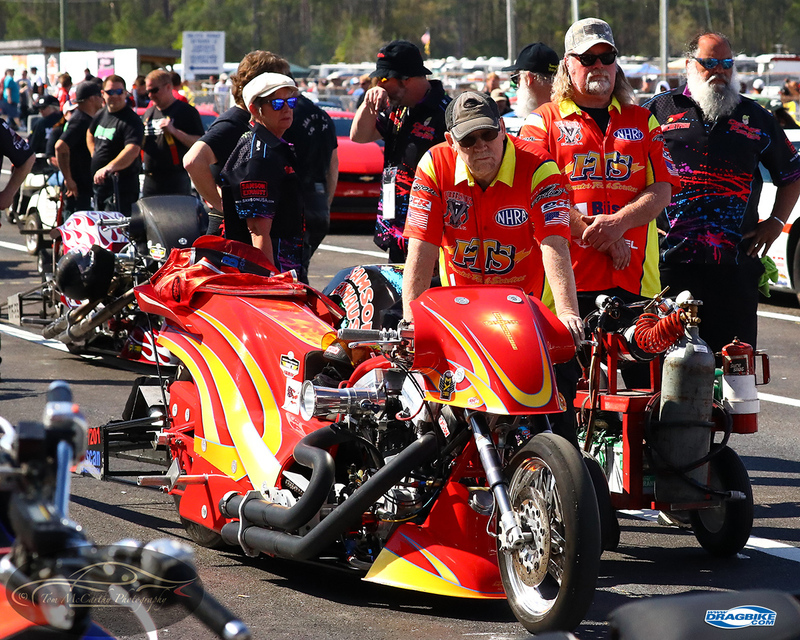 The 2014 Bo Jangles’ paint job on Ron Gledhill’s Top Fuel bike was a crowd pleaser and it’s unique paint combination made it instantly identifiable. Getting noticed and name recognition are strong elements in finding sponsorship. In professional motorsports, developing a solid relationship with solid sponsors is part of the process. Racers should consider offering sponsorship levels. For example, a Level I sponsorship is for the full season, you attend all points races, the race bike is painted in their color scheme with their logo most prominent and racing leathers to match. You agree to attend X # of sponsor promotional events (the PRI show, SEMA, ETC) and you’ll do this for X dollars for one season with an option for a discount if they sign for more than one year. A Level II sponsorship you offer prominent placement of logo emblem on the bike and team shirts, also will do x # of promotional stops. Level III sponsorship, you buy the sponsor banners to be hung at specific races held by the sanction and located prominently where the fans and racers can see it, they sign for X dollars and 3 races. The Level III sponsor also get’s two all-access passes to x # of races and can park in the team pit area. 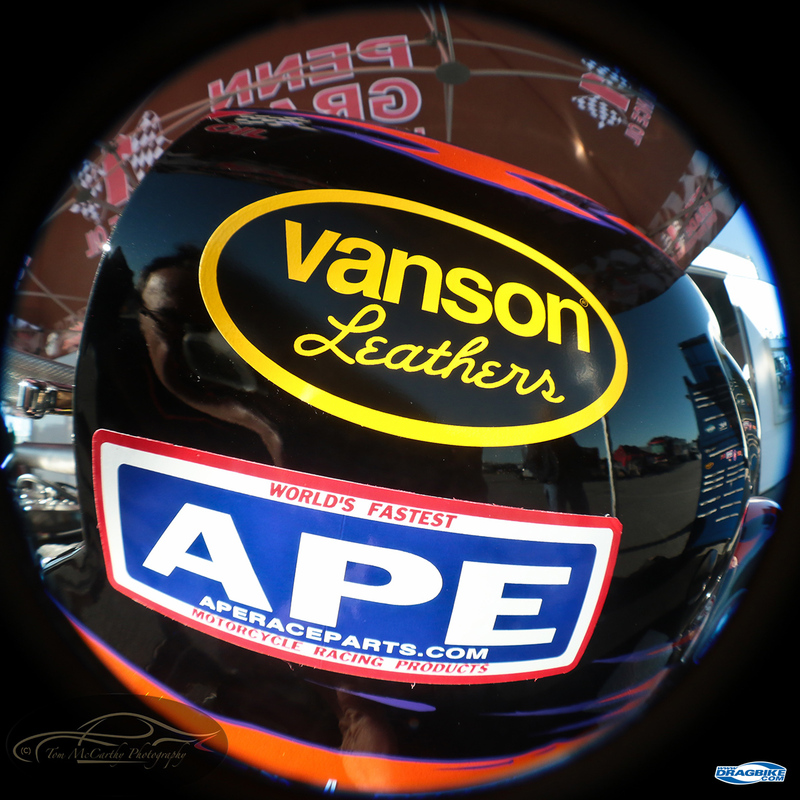 Level IV sponsor – the one race wonder. Team apparel is very important as the professional team is on the track in front of the public longer than the drag bike is. John “Red” Rhea and his PTS team have bright contrasting colors that really stand out and get them noticed. Sometimes it’s a lot easier to find a one race sponsor, someone or some company who really wants to help out, but they can’t do a five or six-figure number. So how about $1,000 a race to send you to the Big Guy Nationals in Buttmunch, Okahomie? If that works for you, take their money and treat em like kings & queens. Buy them prime photos from the one race they sponsored and you may find out the well is deeper than you thought! Here’s another facet of the gem known as sponsorship you all need to know about and the uninitiated know zero about: NOT all sponsors are welcome within all racing sanctions. Racers, before you go out courting The Big Bucks Company, very discreetly ask only the right people, is this company in conflict with my sanction? Because if it is, you may land the sponsor and show up at a race and a sanction official can and will tell you “Tape it over, cover it up, but that’s not going out on our race track.” Yes they can and will do that and yes you will comply, or pack your rig up and leave. 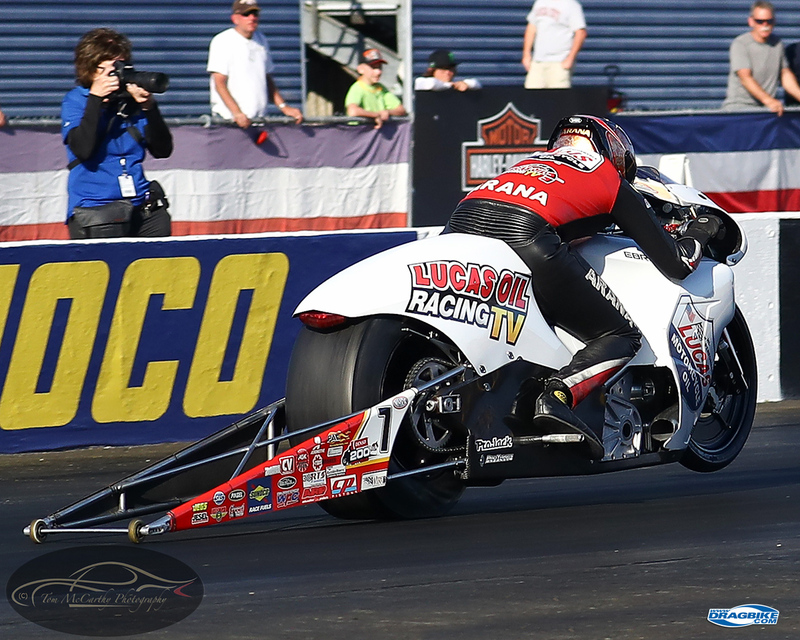 Few motorcycles are better prepared for a TV appearance that NHRA Pro Stock Motorcycles. Here Hector Arana Jr. shows what great color and contrast looks like. Notice how well this stands out against any background – it’s very TV friendly. Racers racing out of their own back pocket can only go so far.